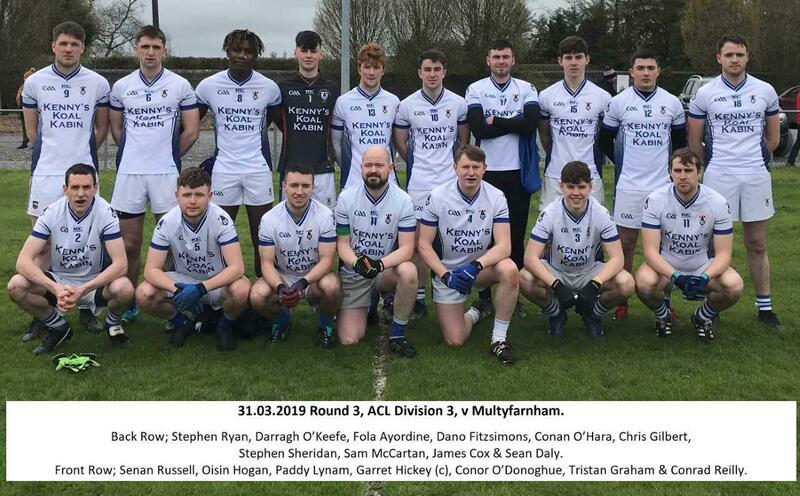 St. Loman’s took the short trip from Mullingar to Multyfarnham last Sunday morning to fulfil this 3rd Round league fixture. Adrian Charles fielded a very different team to the one that comfortably disposed of Garrycastle in the previous round. With only Senan Russell, Oisin Hogan, Paddy Lynam, Fola Ayordine, Conradh Reilly, James Cox, Garrett Hickey and Conan O Hara starting this Multyfarnham game. The home team started sprightly and quickly raced into a 5-point lead with less than 10 minutes on the clock, before Garrett Hickey scored a simple free to open matters for the Blues. Hickey then had an opportunity to raise a green flag when Loman’s were awarded a penalty after Conan O’Hara was dragged down in the square, however despite Hickey striking the penalty kick well, the Multyfarnham goalkeeper pulled off an excellent save. Multyfarnham scored the next point, however they were also guilty of a few wides before Conradh Reilly got his name on the scoresheet with a very well taken point from play. With the first half drawing close to a conclusion, a wayward Multyfarnham pass fell to Hickey, Hickey spotted the opposition goalkeeper off his line and chipped him beautifully to raise St Loman’s first green flag. This left the halftime score line reading Multyfarnham 1-3 to St Loman’s 1-2.When play resumed for the second half, St. Loman’s hit a purple patch when Hickey scored 1-2 in quick succession, moments later an excellent long-range point from Sam McCartan resulted in Loman’s going 4 points ahead, 2-5 to 1-4. At this stage Loman’s were playing very well, but their next 5 scoring attempts either dropped short or went wide. These missed scoring opportunities ultimately became very costly for the Blues, as over the next 15 minutes Loman’s endured a horror show by conceding 5-5, to leave Multyfarnham leading by 6-8 to St. Loman’s 2-5 with only 10 minutes left on the clock. Credit to St. Loman’s as they never threw in the towel, they scored another 2 frees from Hickey and then rattled off 4 excellent points-from-play from the boots of Russell, McCartan, Reilly and Gilbert, leaving the full time score line Multyfarnham 6-10 to St. Loman’s 2-11. Multyfarnham deserved the win on the day as they were more consistent throughout the game, whereas Loman’s were inconsistent throughout much of the game. Despite the concession of 6 goals, Dano Fitzsimmons could not be faulted for any of the goals, neither could our young full back Tristan Graham who performed very well in his new position. Darragh O’Keefe, Paddy Lynam, Conor O’Donoghue played reasonably well throughout, as did Conan O’Hara who won the first-half penalty and also set up Lomans 2nd goal. St Loman’s will now travel to Pairc Chiarian (Athlone) for their next game in 2 weeks’ time. Team; Dano Fitzsimons, Senan Russell (0-1), Tristan Graham, Conor O’Donoghue, Oisin Hogan, Darragh O’Keefe, Paddy Lynam, Fola Ayordine, Stephen Ryan, Chris Gilbert (0-1), Conradh Reilly (0-2), James Cox, Conan O’Hara, Garret Hickey (2-5) & Sam McCartan (0-2). Subs used; Stevie Sheridan, Sean Daly, Johnno Plunkett. St. Loman’s took on table-toppers Tubberclair in Round 3, last Friday evening in Lakepoint Park. As the score-line suggested this was a very open game of football, however it was only in the last 10 minutes that the Saints pulled ahead to secure their second successive win. A win that see’s Loman’s replace Tubberclair at the top of the Division 5 table. St. Loman’s uncharacteristically started very slowly and quickly found themselves trailing by 4 points to a physically strong Tubberclair side, it took at least 15 minutes for Loman’s to find their stride, but eventually they did. This was mainly thanks to some hard graft from both Enda Gaffney and the eventual man-of-the-match Conan O’Hara. Gaffney opened the first-half scoring for Loman’s with a very well taken point and O’Hara closed the first half scoring with 2 excellent goals and 1 point. The first half also saw Pat Walsh contribute with 1 point and the ever-reliable Garrett Hickey scoring 1-1, leaving the halftime score see St. Lomans lead Tubberclair by 3-04 to 0-06. Tubberclair began the second half in similar fashion to the start of the first half, and within 2 minutes of the restart they had whittled Loman’s lead down to 3 points after scoring a quick 1-1. Garrett Hickey then scored Loman’s first score of this half with a well taken point. From the resultant Tubberclair kick out, the ball broke to Hickey again, instead of picking up the ball he attempted an outrageous chip over the goalkeeper’s head from 30 meters out, a chip which beautifully sailed all the way in to the back of the net for a fantastic goal. Tubberclair then responded by scoring 2 quick-fire goals (one was a rebounded penalty) to keep the game in the balance. By this stage Loman’s had introduced Stephen, Sheridan, Johnny Mee, Sean Regan and Gerry Farrell on to the stage. All four played their part, but credit to Sheridan for scoring 2 cracking goals, followed up by another well-worked goal from Sean Regan. Cian Cleary scored an excellent point from play and the final score of the game came from the boot of Hickey, leaving him with a personal tally of 2-5. Despite Hickey’s excellent performance, this win was otherwise inspired by the team’s younger players. The likes of Josh Murphy, Shane Boyce, Enda Gaffney, Cian Cleary, Conan O’Hara and Stephen Sheridan. When referee Robbie Cornally brought matters to a conclusion, it was Loman’s who garnered the win with a winning margin of 10 points. Team; James McKenna, Josh Murphy, Adam Carroll (c), Ollie Plunkett, Oisin Hogan, Senan Russell, Shane Boyce, Tommy Lambden, Enda Gaffney (0-1), Cian Cleary (0-1), Mickey Gleeson, Conan O’Hara(2-1), Pat Walsh (0-1), Garrett Hickey (2-5) & Sean Daly. Subs Used; Stephen Sheridan (2-0), Johnny Mee, Sean Regan (1-0) and Gerry Farrell. The Club would like to offer its best wishes to two club stalwarts Mick Lynch and Joe Glennon. Great to see them out and about again after recent health problems and we wish them both a speedy recovery. Remember it could be you!